I am now fortunate enough to live in an apartment that has a two car garage. But it has not always been this way. for over six years I lived in the Kenwood Towers Apartments complex in Cincinnati, Ohio. 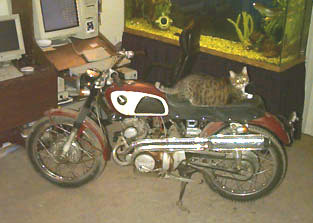 My apartment was on the 6th floor and my precious vintage motorcycles were in the parking lot. My experience during that time has inspired me to make a page of tips for others who might find themselves in a similar situation. The tips are divided into two sections. Section One is for safe storage of your motorcycles, year round in a parking lot. 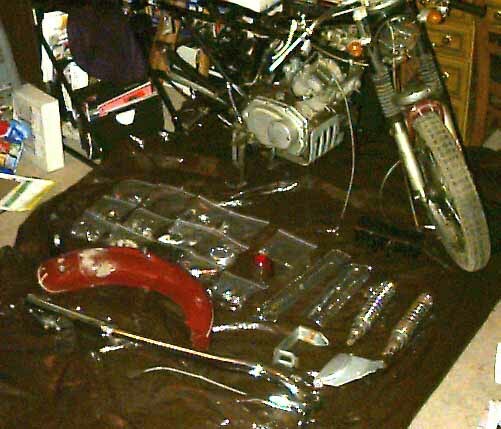 Section Two gives tips for trying to restore a motorcycle in an apartment. Section Two would not be possible without the incredible understanding of my wife, Laura. It seems few people have understanding mates that will put up with a 300 pound piece of metal furniture made by Honda. 1. I strongly advise parking your bike(s) near a light source. An added bonus to this is it can give you a good place to secure your bike lock. 2. Run a large gauge chain around a fixed pole or other object. Then use smaller chains or cables ( coated with plastic ) from the master chain to secure your motorcycle(s). This makes it easier to position your bike for locking and unlocking. Be sure to get a plasitc coated cable. It will protect your paint from being scraped, rusted, or stained by a big steel chain. 3. This is perhaps the most important step. Buy the very best canvas motorcycle cover you can get, then use it religiously. Having up to five or six bikes stored outside though the seasons I have come to know how much difference having a good canvas cover makes. Even if it is not supposed to rain USE THE COVER EVERY NIGHT. The dew that condenses on the bikes over night is more damaging than a light rain. Also, weather has the ability to sense when you leave your bike uncovered. A clear night can quickly turn into a downpour if you challenge Mother Nature with a naked bike. Avoid using plasic tarps if possible. A plastic tarp is better than no cover at all. However, the plastic does not breathe. This means when some moisture gets under the tarp from a ride, dew, or most commonly from rain splashing under the bike, the tarp turns into a GREENHOUSE! This motorcycle greenhouse effect is WORSE THAN LETTING THE BIKE GET REPEATEDLY RAINED ON. The time will come when you get caught on the way home by a rain shower. This means you will have to cover the bike wet. It is now very important that when the rain stops and the streets start to dry you take the bike for a run ( at least 50 mph for 5 min ) to get the water out of the tight spots. At the very least you need to dry your motorcycle. 4. No less than once a month, take your bike to a manual car wash and use the 'Liquid Wax' solution on every part of the bike. After treating the bike immediately dry the bike with a short run. Do this in addition to the usual cleaning and waxing of your bike. Regular waxing will not protect your bike as thoughly as this kind of coat. You simply cannot get into all the small tight areas with a waxing cloth. 5. Park your car next to the bike(s). This will keep you in the habit of looking over the bikes and reduce the chances of a late night driver not seeing the motorcycles and plowing into them. 6. Join Forces. 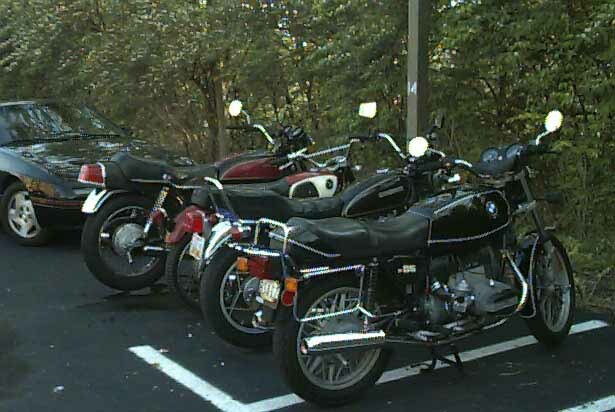 If other riders live in your complex, ask them if they want to share your spot. 4 or 5 bikes can park in one car parking space. This will give you better security, free up some parking spaces and perhaps win some thanks from other residents. 1. One of the greatest dangers in the winter is that after a large snow fall a snow plow will mistake the white hill your covered bike makes for a snow drift! Though it sounds silly, it is a very real possibility. Another related problem is that a snow plower may knock your bike over while pushing the snow out of the drive path. Be careful where you park your bike in the winter. Block access to it with your car or by parking the bike between cars that never seem to leave the lot. Do not park the bike in a corner it the winter. Snow plows LOVE to plow snow into parking lot corners. 2. Do not remove your bike cover when it is frozen. It may damage the cover and your bike. 3. Frozen rain on the motorcycle should always be thawed -- not chipped -- off of the motorcycle. 2. While in the parking lot, unbolt one piece of the motorcycle at a time. Take a picture of the part before and after you remove it. Use a digital camera if possible. Restore / Repair the part and replace it on the motorcycle. Do this one part at a time. 3. Cover the place where the part was removed with plastic and electrical tape. You MUST keep moisture from getting to the exposed parts. Even if you plan to have the part back on the bike in a short amount of time, this is a good habit. You never know when a delay or setback may have you refitting that part back on the next day or even later. 4. 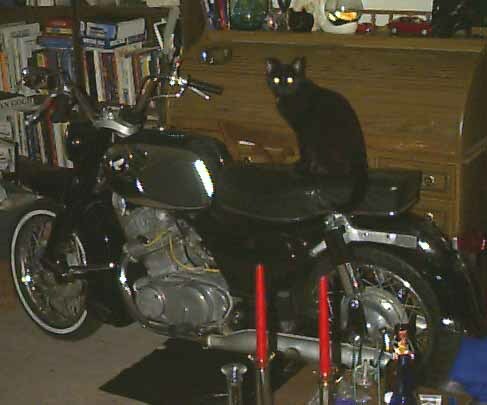 Keep the motorcycle covered. Even if you only plan to have the part off for 30min. This will prevent you from making an eyesore for the neighbors. 5. Use 5-gallon pickle buckets to move the parts from the motorcycle to the apartment. Keep a sack of clean rags and some sort of cleaner at or near the bike. This will keep you from leaving grease marks on any doors or elevator buttons. 6. The hatch or trunk of your car is a great place to store parts or tools while you are working on the bike. Leaving parts or tools unattended near the bike are an eyesore and a tempation. Even if you trust your neighbors and they don't mind the mess, a good natured person may try to 'clean up' the lot and throw away a vital part or tool. 7. When starting the bike point the end of the pipes AWAY from the building. You will not disturb any sleeping neighbors and it will greatly reduce the echo effect when you start the bike. 9. Use old cardboard to protect the lot from oil drippings. If you do spill some oil spray the spill with Gunk or a degreaser and through a pickle bucket of hot water on it. Cleaning Parts in the Apartment. Use your best judgement. Remember to have very good ventalation. Lots of shop towels and pickle buckets make a big difference. Degeaser and tub and tile cleaner help restore the sink to apartment condition. Here are some Additional Tips sent in by a visitor!